“Defense wins championships” is the often quoted sports proverb about what it takes to win it all. 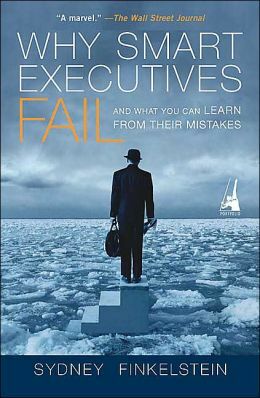 It’s this proverb and its application to my career that motivated me to read Why Smart Executives Fail: And What You Can Learn from Their Mistakes by Sydney Finkelstein. Like Jim Collin’s little book How The Mighty Fall: And Why Some Companies Never Give In , it tells the stories behind the collapse of great companies run by really smart and talented people who, it turns out, focused too much on both personal and organizational offense at the expense of having a championship defense. And every once in a while it’s good for me to have a little defensive perspective, to be reminded of the attitudes I, as a leader, can have and the actions I can take that could lead SpringHill to “lose the game”. One of the best chapters in the book’s called “Seven Habits of Spectacularly Unsuccessful People”. They see themselves and their companies as dominating their environments, not simply responding to developments in those environments. They identify so completely with the company that there is no clear boundary between their personal interests and corporate interests. They seem to have all the answers, often dazzling people with the speed and decisiveness with which they can deal with challenging issues. They make sure that everyone is 100 percent behind them, ruthlessly eliminating anyone who might undermine their efforts. They are consummate company spokespersons, often devoting the largest portion of their efforts to managing and developing the company image. They treat intimidatingly difficult obstacles as temporary impediments to be removed or overcome. They never hesitate to return to strategies and tactics that made them and their companies successful in the first place.